There's obviously been a lot of movement in the GTS class since Pike's Peak and we expect that to be the case again after Fontana. Road America was the third event for five competitors in the top-ten, so with that, one would expect significant shifts in the standings. However, things get even more interesting for Fontana. 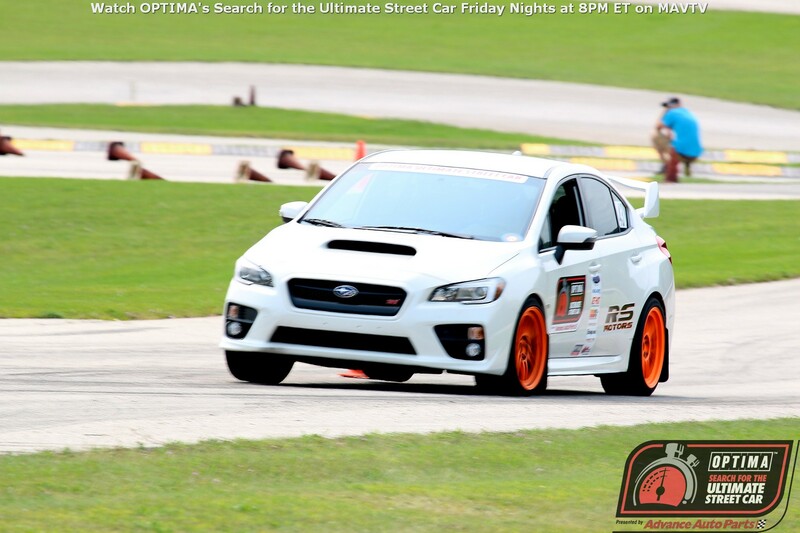 The top-four competitors in GTS have not yet secured invitations for the 2015 OPTIMA Ultimate Street Car Invitational and none of them appear to be registered for the final qualifying event, which is also a double-points event. That means they are all likely to end the regular season with the points they have right now. The question then becomes if they can hold their positions in the standings and if they do fall, how far will the fall be and will they still have a shot at making the OUSCI, based on season-long points? Amazingly, Hugh Bate is the only competitor in the top-ten in GTS points, who is registered for Fontana at this point (and the event is sold out). With that being the case and Bate's past performances this season, it seems likely he will finish the year well beyond 500 points- if he can finish the event at Fontana. As we've mentioned in the past, this is yet another instance where someone must first finish, if they hope to finish first. Bate has already qualified for the OUSCI, so his point total will be inconsequential in that regard, but the fact that no other current top-ten GTS competitors have registered for Fontana, means the OUSCI invite that will be awarded to the top non-qualifier is there for the taking. It belongs to Jeremy Stensland right now, but with so few non-qualified GTS competitors signed up for Fontana, he may be able to hold onto it. The one competitor who could knock Stensland off his perch is Bob Denny, who is the only non-qualifier in the top-30 in GTS points (he is currently 12th), who is registered for Fontana. Denny has only run two events so far this season, so the points he receives at Fontana will be added to his current total of 254.0067. Even though the GTS field for Fontana is relatively-small at 10 vehicles, it would take an incredible performance for Denny to win the championship. A perfect score at Fontana would be 250 points and Denny would need 219.0934 to pass Stensland. His previous best is a 184.9333 at Charlotte Motor Speedway. Hugh Bate's GT-R and the Corvettes of Hoback and Hobaugh will certainly keep Stensland's VW R32 honest, but others have already proven it can be done, even by someone who doesn't win their class at the event. Denny and Bate's likely march through the standings aren't the only changes on the horizon at Fontana. Rick Hoback has had deceptively poor showings at some of his earlier events this season and could move up significantly in the standings...if he even makes it to California. Hoback's Corvette encountered some significant issues at a track event in Pennsylvania last month, which he is working to resolve, but some question remains as to whether or not that will even be possible. 2013 OUSCI Champion, Brian Hobaugh currently sits in 24th place, but a solid performance at Fontana would likely move him into the top-ten. However, after those four competitors, one would have to go all the way back to Carrie Willhoff in 35th place, to find the next GTS competitors signed up for Fontana. That means no one else is likely to challenge the top-ten in that class, but someone will walk out of Auto Club Speedway with an invitation to the OUSCI. Bate, Hoback and Hobaugh already have their tickets punched, so who will be next? While the event is sold out to competitors, VIP Pit Passes are available for fans to purchase online here. Don't forget to catch new episodes of OPTIMA's Search for the Ultimate Street Car, presented by Advance Auto Parts every Friday night at 8PM ET/PT only on MAVTV.